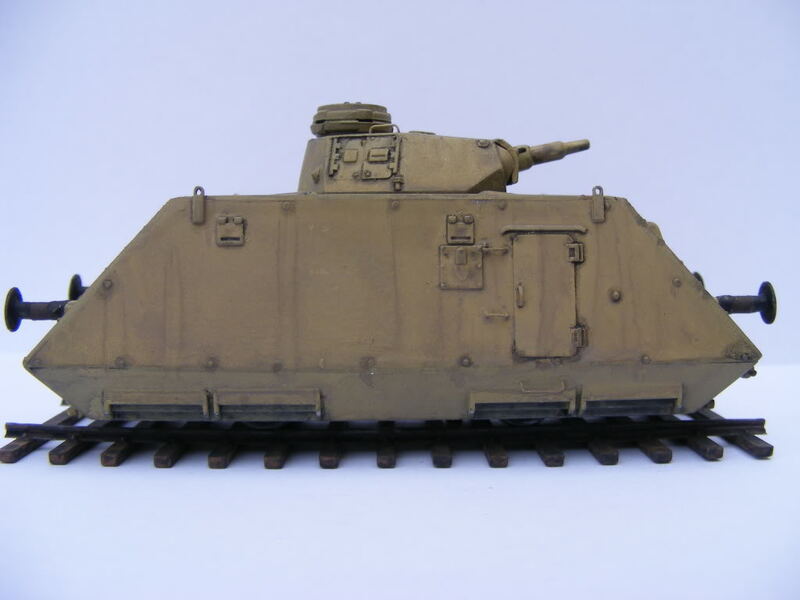 Heavy Artillery Armored Car S.Sp. 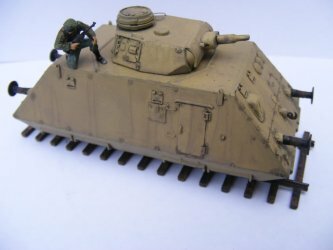 The 'Sp' is short for 'Spähwagen' (scout car) and the 'S' is an abbreviation for schwere (heavy). These cars were self propelled with an air cooled 76 h.p. Steyr motor. These cars were in combat operations from late 1944 in the Balkans and could be configured as full or half trains (Armoured Heavy Scout Trains, numbers 201-210) with a mixture of artillery, infantry and command cars, as well as with tank carrying cars, pushers & 20mm quad flak cars. Being late war, there are not a lot of photos of these, and all are black and white, and seem to indicate they were painted overall in German yellow, similar to how many panzers were painted. This makes for a simple paint job, but it's how they were. They also seemed to have no markings. Some that survived the war may have had markings added afterwards. The kit was pretty straightforward and I built it pretty much straight out of the box. Overall construction was simple with few problems. No warped pieces and no flash, except on some turret pieces. The slab sides, ends, chassis and top of the hull are all a very good fit, with no extra sanding or modification needed. There are a few very minor hairline cracks on one or two joins, which are barely noticeable, and were very easy to fill. One side of the body there is a small fissure that almost looks like battle damage - appears the plastic didn't quite cover this area & will be very easy to fill - you can see it in one of the pictures below. The buffer beam supports were not a good fit into the body. I cut the locating pins off the ends to ensure a flush even fit onto the mountings. The round buffer faces have very small sink marks - these were easy to fill. The gun barrel will need drilling out. Wire rungs were added to the body sides and the turret roof, as the kit comes with moulded on lugs that don't look good. The Panzer III turret had a bit of flash, and the turret roof needed some sanding to make it fit. 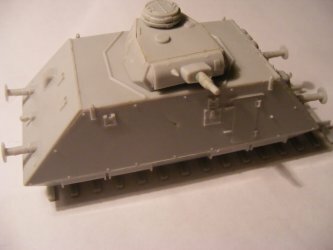 I couldn't find my old Revell Panzer III Ausf. N to compare against the UM version. What is supplied in the kit looks the part, though I'm sure a Revell turret would be better detailed. The pistol ports at the rear of the turret were not cast in a fully rounded shape, some sanding improved their shape a little. 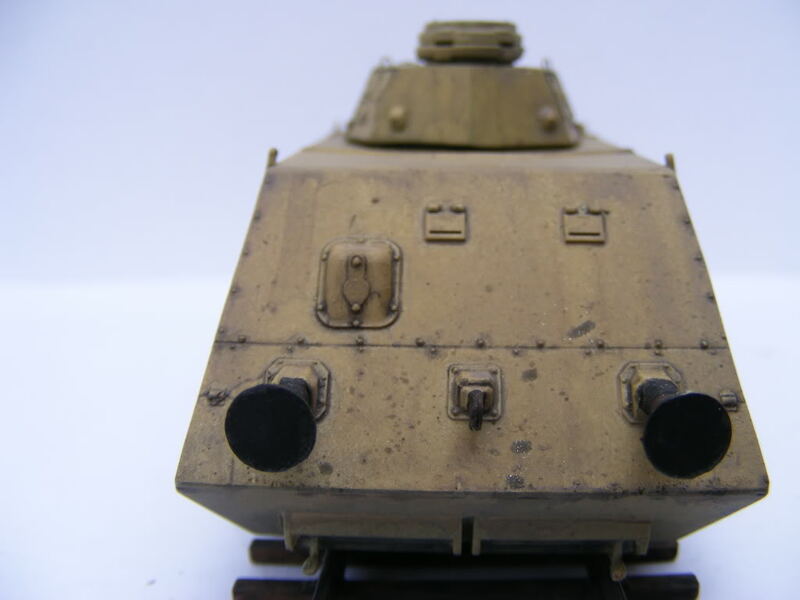 An ESCI Panzer III turret I had on hand fit nicely, but as it was from a Flammpanzer I didn't use it. Part B1 was missing from the kit. This is a tiny piece measuring perhaps 2mm x 1mm and locates on the lower hull between the exhausts. I'm not sure if I lost it, if I did it must have been loose in the bag. I doubt anyone other than a rivet counter would notice it's missing, but it will be an easy job to make another from a piece of plastic rod. The axle and wheel assemblies are a little sturdier than on the D-37 & DT-45 railcars, but I glued mine in place anyway, as this will be a static model. The rail track supplied with this kit is a couple of millimetres narrower than the track that comes with the D-37/DT-45 kits. 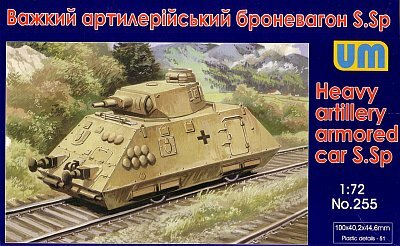 As these were probably not operational on Russian broad gauge this is probably correct. Pictures exist of these cars in Germany and on duty in the Balkans. My in-progress picture shows the model built totally 'out of the box', with no modifications, or filling, or changes, yet. I've yet to add the pioneer tools & the gun cleaning rods, which will be added after painting. Wire rungs will be added on the body sides and the turret roof, as the kit comes with moulded on lugs that don't look good. The kit comes with a set of solid Balkan crosses without outlines (similar to those used on Panzers), in black and white. Wartime pictures of these are uncommon, those that can be found show no markings. There are photos of one taken post war with Balkan crosses the same as supplied with the kit, but it's possible these were added after the war. Going by some antenna masts included on the sprues and the fact that the Infantry and Command Heavy types share approximately 90% of the same parts as this kit, it appears that UM will be releasing the Infantry and Command versions of this car sometime in the future but so far there has been no sign of them. This may be due to some serious mould problems reported by other modellers. I'm hoping UM makes all the needed components to construct a 7 or 14 car train, as I'll definitely be buying all the components, based on this kit. It was not a difficult build.